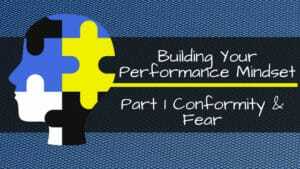 Welcome back to a brand new blog series all based around building your performance mindset. We just finished with the last series which was all about the 5 shifts you need to make to get yourself on the road to the freedom lifestyle. In that series one of the shifts I advised you to make was the mindset shift. Even though I briefly covered what you needed to do in that blog, this series will seriously break it down for you and give you all the tools you need to gain your performance mindset. So what is a performance mindset and why do you even need it? How you price yourself in the market based on the solution that you have to offer. The things that you solve for your ideal clients. The problems that you take away from them and how you’re able to take them from where they want to go to where they want to be. But how do you do that if you’re not operating at your highest level? How do you make sure that you’re able to connect with people, lead them, inspire them and do the things that you need to do in order to help them best, but in the process help yourself as well? Meaning that regardless of where you’re starting from, regardless of the situation you might be in financially, logistically even the circumstance you might be in, in your relationship, with business partners or where you are in the world. 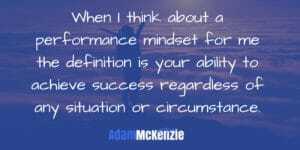 What you have access to regardless of all of those external things is you have the type of mindset that is able to turn those things into an opportunity, to create success regardless of anything that’s thrown at you or any challenge that you have to face. So based on that why do you need it? So if you’re not willing to work on you as much as you’re willing to work on your business you’re never going to achieve the level of success you want. Because like anything; what you know now is what you know based on everything that’s happened to date. What you’ll know in the future will be based on the actions you’ve taken and your ability to spend time working on growing yourself. Until we do that sometimes we don’t even see other opportunities that are in front of us because our knowledge is based on what we know. Like you only know what you know. Right? How they’re affecting you now. How they’re popping up in your life in, your relationship and in your business. Then work out how you can start taking action towards changing these things to create different outcomes that are in line with the results that you want. Because ultimately how do I work on myself if I really don’t know where I’m starting from? I’ve got to get that baseline sometimes which often comes down to our core belief systems but also comes down to seeing the way sometimes we react to certain circumstances, our attitudes, our behaviors etc, and then really taking a good hard look at the results we currently have, because the results that we currently have are also a measure on how much we’ve been willing to grow ourselves to date. It doesn’t mean results aren’t coming for you in the future but like anything if it’s not growing it’s dying. So if you want to make sure you’re constantly growing you are going to have to start approaching your growth in a proactive way which is something we’re going to dive into. As always I always recommend in my podcasts and in my blog series to take some notes down and to read or listen to it again in the future because sometimes you’ll hear or read things a certain way and sometimes it might not sink in based on whatever’s going on in your life. These are the key things that I constantly focus on and work on to make sure that I can create my own performance mindset that I’m able to achieve the level of success I want regardless of any external stuff that’s going on. The first two things we’re going to look at is conformity and fear and doing things in your life based on how other people are doing things. Conforming to the norm and doing things because somebody else did it that way and doing it because you saw someone else do it that way is following the herd because that’s the way everybody else went, right? Meanwhile, most the time when you follow the herd they’re going to end up at the slaughterhouse, the one that went the other way though was happy to carve out his own path and ended up not getting butchered. It’s a bit of an extreme example but you know the saying! The same goes for fear. So often these first initial two points are the main reasons why we do and don’t do something or when we do do it we only do it based on how we’ve seen everybody else do it. We don’t push the envelope, we don’t really try and stretch and really see what’s possible for us because we’re afraid and that’s where the fear kicks in, we’re afraid that it might not work, we’re afraid that we might fail, we’re afraid that people are going to judge us, we’re afraid that we might get rejected. We end up conforming we end up falling back into our little comfort zone and we don’t do what we need to do and we don’t stretch ourselves to really take things to that next level. Really have a look at aspects of your life now where you may be conforming and where you are letting fear dictate your actions or your lack of actions. Next up in the next blog in this series I’ll be talking about Expectations & Assumptions. To make sure you see the next post as soon as it comes out, join me and other entrepreneurs seeking the freedom lifestyle in my Facebook group where I post everything first, you can join here for free.